Thirukoshtiyur (Thirukkotiyur) is one of the 108 divya desams in Sivaganga district near Thirupathur,Karaikudi. The legend behind the temple is that during Kritha yuga, Rishis, Devas and other innocent people were tortured by the asura Hiranyakashipu as the vengeance for Hiranyaksha's death in hands of Lord Vishnu in the form of Varaha Avatar. Devas, Rishis approached Brahma and Shiva to save them. Brahma, Shiva, all devas, Saptha Rishis decided to meet at one place to discuss a solution. They all assembled at Thirukotiyur. As they came in a group and hence Thirukoshtiyur, koshti meaning a group or a team. 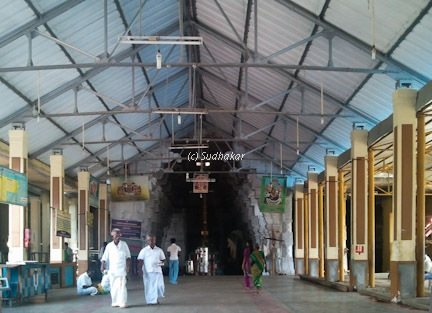 On entering the temple is the "Thirumaamani Mandapam", where the sanctum of Lord Shiva is situated and he is known as "Sarabeshwarar". He is said to be a Suyambu ( on his own ). The shrine for Sri Narayana is constructed in form of three stages, or in three tiers. This signifies as Boologam (earth), Thiruparkadal and Vaikundam. Narayana appears in three stages in three forms as as Nindran ( Standing posture), Kidanthan ( sleeping posture), Aadinan (dancing posture) . In Ground floor you can see him as Krishna in a dancing posture. Next level after climbing a few stairs, is the main sanctum and you can see Sri Narayana in a sayana thirukolam resting on Adhisesha and he is called as Uraga Mellanayaan . And top tier you can see him in a standing posture as Sri Sowmya Narayana Perumal. Another interesting historical fact is the relationship between Sri Ramanuja and Thirukoshtiyur. Ramanuja was advised by Thirukachi Nambigal to visit Thirukoshtiyur and learn the , Ashtakshara (' 8 letter hymn ') manthra from Thirukoshtiyur Nambigal. Nambigal had asked Ramanuja to keep the mantra to himself. But Ramanuja felt that sharing this mantra with the public as it should be useful to all of them.He went straight to the temple of Sowmya Narayana perumal and stood on the huge walls and he loudly pronounced the Ashtakshara Mantram. Selva Nambi got angry on Sri Ramanujar since he has broken the promise.He called Sri Ramanujar and said that having broken the promise and as a result, he will be going to the hell. Ramanuja replied that it was his great fortune in showing the path and guiding people to Heaven, and he would not mind going to hell for the act.These words affected nambigal to the extent he just prostrated towards Ramanuja and called him as Emperumaan. We can find two separate statues that is made of bronze for Thirugoshtiyoor Nambi and Sri Ramanujar in this temple. The Moolavar of this sthalam is Sri Uraga Mellanayaan. Moolavar is in kidantha (sleeping) thirukkolam and in Bhujanga sayanam facing the east. Festivals & beleifs Every year millions of people assemble at Thirukoshtiyur for the temple float (thepposavam) event during the Tamil month of Maasi (Magha - mid March). It is believed that one who takes the sacred lamp from the theppam and wraps it on a yellow cloth and worships the lamp at their home is blessed with the boon they seek, especially those wanting a child or a marriage. Once the wishes gets fulfilled, the devotee returns to the temple with the lamp and leave additional lamps as per their wish. Mangalasasanams The temple is revered by the verses of Tirumangai azhwar, Namazhwar, Periazhwar, Boodathazhwar, Peiyazhwar and Thirumazhisaiazhwar. 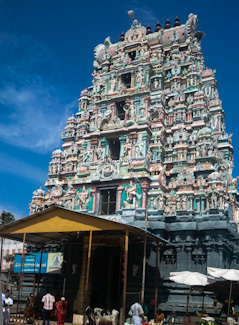 Temple location It is situated 28 Kilometers North of Sivagangai Railway Station and 23 Km West of Karaikudi Junction. Buses are available from Karaikkudi,Tirupathoor, Sivagangai, Madurai, Trichy. There are local buses and autos from Tirupathoor too which is just 6 kms away. Thirukoshtiyur is situated on the main road between Sivagangai and Thirupathur. Station at Karaikkudi and visit many heritage temples in the surrounding area of within 20 kms radius. Where to Eat?There are no big restaurants in Thirukoshtiyur. You can reach Karaikkudi town for lunch / dinner.